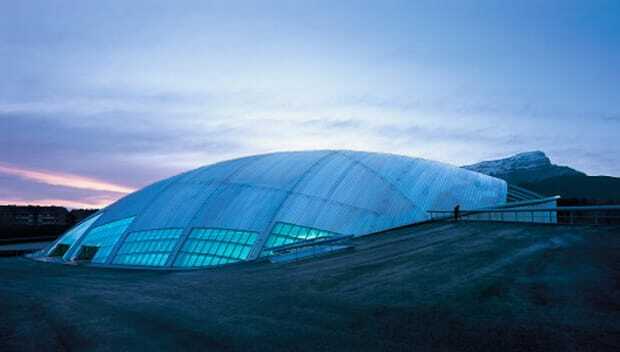 At the foot of Pyrenees in Spain is a very modern interpretations of an ice hockey rink. The arena mimics a drop of water falling from the mountains as the building appears frozen on the ground thanks to exclusion of a visible facade. The outer dome membrane keeps all the functional elements inclusive such as the structure, roof, lighting, security and air conditioning systems as well as the divisions of space within the arena. This allows the interior to contain only concrete, brick and ice for a beautiful fusion of minimalism and natural elements.